SALEM, NH – June 5, 2010 – Since moving to a new 20,000-square-foot facility in 2006, Appli-Tec has been working to expand its premixed and frozen adhesives manufacturing capabilities by upgrading its infrastructure with state-of-the-art production and testing equipment. In the previous year alone, the company increased its capacity and functionality four-fold. Multiple work stations were installed in manufacturing departments in anticipation of continued and future growth and to ensure that production is never interrupted. The new stations were created with a more ergonomic design than earlier versions, yielding an improved process flow. The company also installed an automated packaging system, which can nitrogen purge and evacuate outer packaging. Additionally, a new custom-designed quench-cooling process was implemented to minimize temperature variation during freezing, maximizing pot life. Frozen materials are cryogenically stored and protected by the company’s battle-tested freezer backup system, which preserved its inventory during the devastating storms of Dec. 2008 (ice) and Feb. 2010 (wind) that caused widespread power outages. The backup system, which maintains temperatures at specified set points for each freezer, responds automatically and instantly to power interruption or mechanical failure. 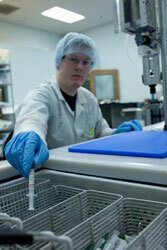 Material validation has always been Appli-Tec’s core competency. Relying upon statistical process control, a data management system that employs statistical probability to set upper and lower control limits, Appli-Tec closely monitors the effectiveness of its processes and the reliability of its products. The recent addition of a key employee with 10 years of industry experience in research and development and quality control has further enriched the company’s knowledge base and its capacity to provide customized solutions for unique applications. Appli-Tec is currently working to implement a two-dimensional bar code system that will enable its customers to record multiple lines of data with a single scan. Appli-Tec provides full-service adhesive packaging solutions, including premixed and frozen syringes, multi-component pouches and cartridges of non-reacted material, and large-volume containers. The company also offers an array of specialty services that includes custom material development; potting and encapsulation; conformal coating; casting, slicing, lapping and CNC machining; bonding, staking and tacking; and cryogenic storage.